Eliminate the guesswork from selecting products and services for your evolving network access and business protection needs. HP Just Right IT portfolio solutions help avoid business interruptions by ensuring reliable access to your data. HP servers and storage solutions help consolidate islands of business information while delivering cost savings, reliability, and agility. 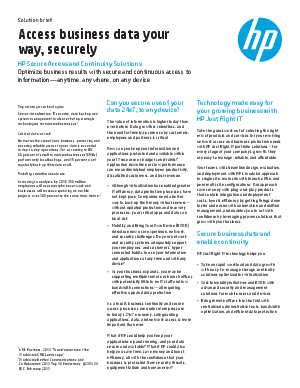 HP offers the industry’s most comprehensive data protection and retention portfolio for midsize businesses like yours. And through its cloud-based support portal, HP Technology Services can proactively identify and fix them remotely to keep your business running smoothly. Discover how.